Neither China nor India could sustain their current high pace of growth without either direct materials imports from Russia or, indirectly, from the global marketplace. In 2001 Goldman Sachs strategist Jim O'Neill first proposed the acronym BRIC to group together Brazil, Russia, India and China, four of the world's fastest-growing economies. In 2010 South Africa joined the group, changing the acronym to BRICS. For many years the theme worked very well. For example, the MSCI Emerging Markets Index, a measure dominated by the BRICS countries, expanded by 270 percent between January 2000 and 2007, while the Developed Market Index gained by only 28 percent. However, since the emergence of a more difficult global economic backdrop the situation has changed. The Emerging Markets Index lost 16 percent while the Developed Market Index has grown by 12 percent since January 2008. But while investors have cooled to the BRICS theme, the opposite has taken place at a political level within the major economies. 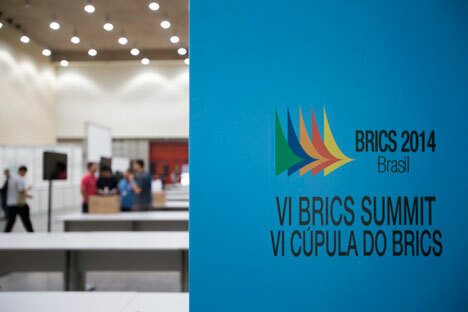 The leaders of the BRICS countries will hold a summit in the Brazilian city of Fortaleza this week to discuss an agenda that includes the first concrete steps to formalize their political and economic relationship. Their decisions will likely rival some of the established global political and trade structures, such as the World Bank, which they increasingly criticize for prioritizing the interests of the major developed nations. The recent sanctions led by the U.S. and EU against Russia has certainly added some impetus to the process of converting the investment acronym into something more substantial. China, for example, is already in dispute with Japan over territorial claims. Inevitably these disputes will only worsen and could even lead to political and trade confrontations with global institutions led by the West. For those reasons, one institution expected to be green-lighted at this week's summit is a BRICS development bank. The bank, which will be a rival to the World Bank or Asian Development Bank, is expected to have initial capital of $100 billion and, very likely, will be headquartered in Shanghai. The purpose of the bank, according to informal comments from senior officials in all five countries, is to promote and partly fund investment projects in the five countries and to help foster a greater level of investment and trade between members. Many commentators also see the setting up of a development bank as the first step in breaking the dominance of the U.S. dollar in global trade. It is expected that we will soon see some deals between members, for example, in the energy and raw materials sectors, denominated in BRICS currencies. While many may focus on the political reasons for the BRICS countries forming a closer alliance, there is plenty of economic justification to give credibility to the plan. The latest International Comparison Program Survey, which calculates the size of national economies based not on the traditional exchange rate formula but on a purchasing power parity, or PPP basis, shows the BRICS to already be a powerful global force. The PPP formula is a much more useful measure as it better reflects the activity in an economy and, therefore, the potential returns for business investors. On this basis the survey showed that the BRICS countries combined gross domestic product, based on PPP, is equal to 30 percent of the total world GDP. The top six developed nations account for a 33 percent share. Of course China is the dominant player in the group, and that too will be a source of criticism. But it is normal to have one dominant partner in almost all global trade and political groups. The U.S. dominates the Group of Seven leading industrial nations and World Bank while Germany dominates the European Union. The key is to create internal mechanisms and processes so that the group caters for all of the members' needs even if one member has a bigger say more often. Another perennial issue when it comes to the BRICS theme is whether Russia should be a member. That was a worthwhile question when the sole purpose of the acronym was for investor portfolio construction. But, as mentioned, we are way past that now. Within this new group, Russia certainly has a role. The country is the world's biggest energy exporter and, on aggregate, the world's biggest minerals exporter. Neither China nor India could sustain their current high pace of growth without either direct materials imports from Russia or, indirectly, from the global marketplace. That alone justifies a seat at the BRICS table. Beyond that, Russia is already one of the largest consumer markets in the world and is, on a per capita and per household basis, the largest in the emerging market world. Defining exactly what is the middle class is highly contentious. However, by the Organization for Economic Cooperation and Development's standard definition, Russia boasts a middle class segment equal to 50 percent of the population compared with 30 percent in Brazil, 21 percent in China and 11 percent in India. According to a recent study carried out by the Boston Consulting Group, the wealth of Russian households actually increased by 21.9 percent in 2013 to a value of $1.92 trillion. That was despite the slower pace of economic growth in the economy. The survey also showed that the wealth of the already wealthy segment, that is, those households worth between $5 million and $100 million, increased by an even faster 34 percent. The number of millionaire households in Russia is now 213,000, the 13th-highest total in the world. There can be no question that Russia is a large and important economy. While portfolio investors are currently wary of risk and volatility, business investors will continue to invest. The fledgling BRICS group may see more of those investors coming from emerging countries than has been the case in the past. If progress continues then it can be expected that other big economies, such as Indonesia, will apply to join the BRICS group. It is currently reported that Argentina has asked to be a member but may have to wait until its current debt crisis is brought under manageable control. If the founding group of countries get it right from the start then there is no reason why the group may not eventually rival the G7. It would, however, be a real mistake if the new structures were built on a confrontational rather than cooperative basis. That is where the real payoff is not only for developing economies but for the global economy. Cooperation both at a political and trade level can certainly lead to a higher sustainable pace of growth for everybody. Meantime the fledgling BRICS group has to figure out not only where to base the bank but also how it will operate and how decisions will be made. In parallel to that the five countries have a great deal of work to do in such areas as coordinating policy making and domestic reform initiatives so that there may be eventually be greater cohesion inside the group. A huge task lies ahead for sure. But one factor is now at least clearer. While the original BRICS idea is past its useful life as a smart investment strategy, the current BRICS format is a very smart political and business strategy.